*Sniffle* I just used the last of my frozen roasted pumpkin puree from the Fall pumpkin harvest 🙁 But oh looky here – the pumpkin puree was sure put to yummy use! As our babies move further along in their solid food introduction, we likely begin to think about offering healthy “treat” types of foods: muffins, pancakes, cookies for example. Now, let’s be honest, even though we may enjoy consistently eat only healthy nourishing foods, a treat here and there is indeed a welcomed friend. The thing is, treat foods don’t have to be laden with sugar or come from a box and many can actually provide some nourishment. These tiny pumpkin muffins look rather plain and boring but they are bursting with flavor; sift all the dry ingredients together and you will have a light and fluffy texture. This texture is perfect for little self-feeders to pick apart! 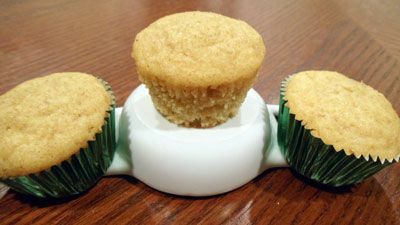 Step 6: Bake for approximately 10 minutes in mini-muffin tins and up to 15 minutes if using regular muffin pans. Makes 24 mini muffins and a bit – With the extra batter I had, I baked a little cake in a small casserole dish. ** You may substitute the following for the egg: 1/2 cup applesauce / 1 small mashed banana / 2 tbsp ground flaxseeds simmered in 6 tbsp of water – flax will add some extra nutrition, Omega 3s!